Over and over, it drove by our house, announced by its cheery songs. It triggered memories of childhood joy upon picking a treat from a similar mobile merry-maker. 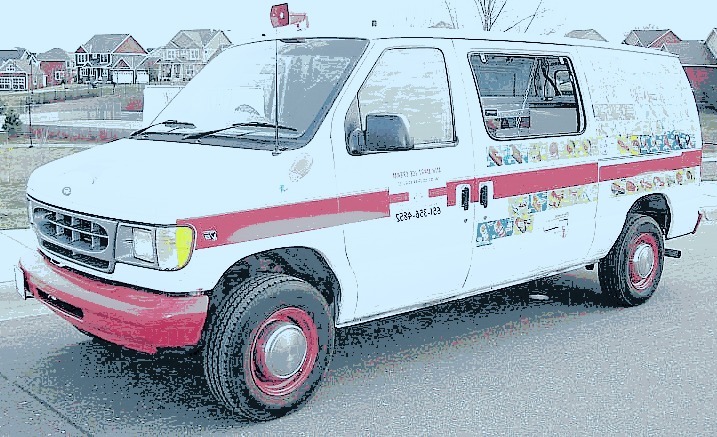 What child isn’t excited to hear the ice cream truck? Longing to share such summer joy with our children, I briefly considered running barefoot to flag him down. I placed my hand on the door knob only to be stopped by a mind filled by an urgent stream of questions. Food allergies sometimes throw a monkey-wrench in spontaneity. How many of those treats contain nuts? How many are cross-contaminated? How many have original manufacturer labeling? Does the driver know these answers? If not, is it OK for me to make a phone call to a manufacturer while he waits for me to buy a popsicle for $1? What if I blow our son’s mind by telling him the ‘van’ is an ice cream truck and then have to him he can’t eat anything on it? I just couldn’t take the chance of squashing his joy. Going home and giving him the band aid of a ‘safe’ popsicle from our freezer just wouldn’t have been good enough. Suddenly it was a relief that he doesn’t know what that so-called ‘musical moving van’ is really up to. Today I didn’t have to explain to him why we could not buy those treats. It was a blessing that he did not see excited children lining up enjoy ice-cold goodness. This ice cream truck innocence will not last forever. The odds of the truck rolling through our neighborhood again without delighted children spilling-the-beans seems slim. I’m sure next time we won’t be so lucky and our son will discover its true purpose. I know his eyes will widen with wonder and eager delight – it is very important to me that I not have to tell him we can’t eat anything on it because we already avoid so much. SO, I decided to be prepared before the its inevitable return. Planning ahead is an allergy mama’s most powerful and necessary tool – joyful childhood memories depend on it. As our children marveled at the music, I scribbled down the name of the company and its phone number (helpfully displayed on the side of the truck). I found the business online will call them in the morning to pepper someone other than the ice cream truck driver with allergy-related questions. Assuming something is safe (nut-free), I cannot wait to introduce our children to the ice cream truck. And yes, I’m prepared to deal with crying when the truck goes by and we decide not to participate for reasons other than food allergies (already had a treat, no cash, haven’t eaten dinner yet). Today, our children’s ice cream truck ignorance was bliss for me. Next time, equipped with allergen info, the revelation of the ice cream truck’s true identity will be bliss for our children. Oh friend, I feel your pain. 🙁 I’ve stood behind my Little Man as we both cried at the Walmart cake counter because he just so wanted a store bought birthday cake and for ANOTHER year, he was going to have to have a Mom made cake. It is SO difficult! Good idea though for calling the company to check and see if anything is safe. What a great job thinking ahead to avoid a heart-breaking situation. You’re doing such a good job, Mama! 🙂 Hugs from one allergy mom to another! Wow the things you don’t think of when you don’t have food allergies. I can relate slightly because I wanted our daughter to avoid typical kid foods like fried everything. I quickly learned that was much harder than I imagined and started to give in. Impressed with your diligence. Thanks for sharing – I appreciate and understand your efforts with your daughter. I actually did the same with our son before we learned of his allergy. And of course you can relate – we all want what is best for our kids! Appreciate your thoughts. Great idea, ours drives by or I hear it in the neighborhood, I’m going to look next time for a number/company to call. My D-man still doesn’t know what it’s for either….but that time is fast approaching!